"Burnaby - 3880 Henning Drive"
Aerial photograph of Dominion Bridge Company's Burnaby Plant taken 1000 feet above ground from a Fleet Canuck (a Canadian designed and built light aircraft). Note in black felt pen on recto of photograph reads: "FROM 1000' / AUG. 1946"
Note in black ink on verso of photograph reads: "D.B. Co. - Burnaby Plant./ Taken from 1000' - in fleet Canuck/ with Brub - Aug. 1946." Photograph of Tom White, Dave Maw, and Bert Vicars, three Dominion Bridge Company staff, standing in front of a car that has been parked in front of Dominion Bridge Company's Burnaby Plant. 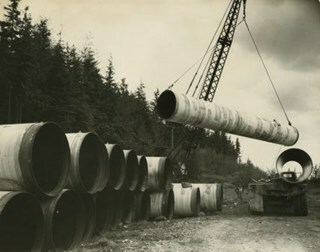 Note in black ink on verso of photograph reads: "Tom White / Dave Maw / Bert Vicars"
Photograph of a crane lifting a large pipe on or off a truck at the Dominion Bridge Co. Ltd. A number of other pipes are piled at the left side of the photograph. Printed on bottom of photo, "Dominion Bridge Co., Limited / Pacific Division"
Printed on back of cardboard "GIL: Graphic Industries Ltd. / Vancouver's Most Complete Photographic Service / 54 West Hastings, Vancouver 4, B.C. 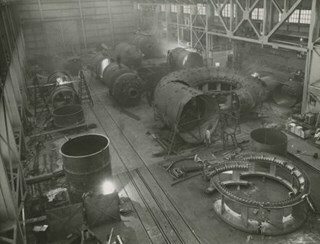 / Phone Pacific 4174 File No: 3850-4"
Photograph of the fabrication of large construction industry components inside a Dominion Bridge Co. Ltd. building. Printed on back of cardboard "GIL: Graphic Industries Ltd. / 54 West Hastings, Vancouver 4, B.C. / Phone Pacific 4174 File No: 2844 1"
Stamped and annotated on back of cardboard, "Dominion Bridge Co. Ltd. / Vancouver, B.C. / Neg./Print #55-DB-3-32" and "Jan. /56"
Photograph of the interior of a Dominion Bridge Co. Ltd. building. 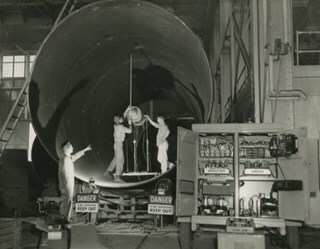 Three men are working on a large pipe. Two signs read, "Danger / X-Ray Operating / Keep Out." 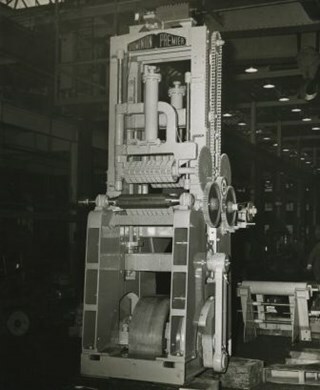 Stamps on back of photograph read, "Dominion Bridge Company, Limited" and "Jan 25 1957"
Photograph of the interior of a Dominion Bridge Co. Ltd. building with a piece of machinery with a plate reading, "Dominion Premier" on it. Stamp on back of photo reads, "Dominion Bridge Co., Ltd. / Vancouver, B.C. 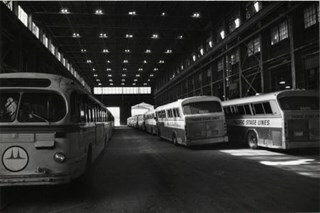 / Neg./Print # 57-329"
Photograph shows stored buses in the old Dominion Bridge building at the corner of Boundary Road and Lougheed Highway. BC Hydro took over the building in 1976. According to the photographer, it was built in 1928-1929 with the north section being added in 1943. The north section was used as a munitions plant during World War II. 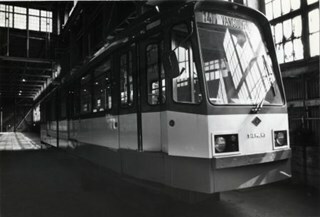 Photograph shows Siemens track vehicle stored in the old Dominion Bridge building at the corner of Boundary Road and Lougheed Highway. 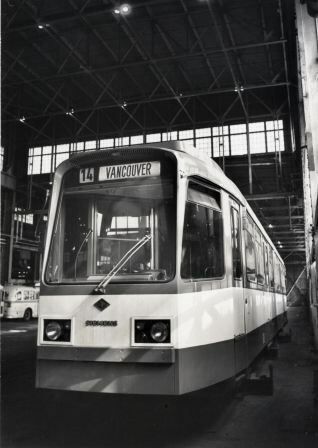 According to the photographer, this vehicle was bought by BC Hydro under the NDP government (1972-1975) to initiate rapid transit but it was never used partly because of the wrong gauge on existing rail lines. Photograph shows Siemens track vehicle stored in the old Dominion Bridge building at the corner of Boundary Road and Lougheed Highway. 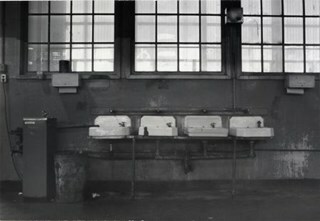 Photograph shows wash basins and drinking fountain in the Dominion Bridge building, owned by BC. Hydro. 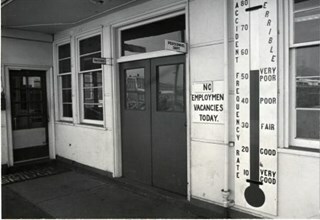 Photograph shows the employees' entrance to the Dominion Bridge building on Boundary Road. 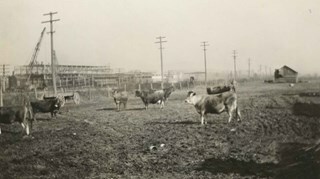 Photograph of Jersey cows in the field on E.W. Nicholson's Farm. The Dominion Bridge Building can be seen faintly in the backgound (at 3880 Henning Drive).